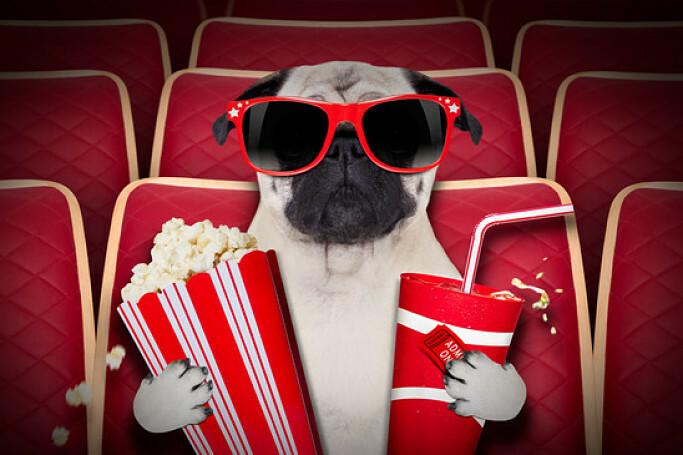 Can Dogs Eat Popcorn Safely? Should You Give Your Dog Popcorn? Welcome to the latest article in my nutrition for dogs series. This time I’ll be answering the question of can dogs eat popcorn. Many people like to relax by watching movies at home while they sit on the couch munching on their popcorn. And of course dog owners like nothing better than to share their favorite snacks with their best friend. Especially once their dog gets the smell of it and sits looking at them longingly with their big, pleading eyes! The first thing to know is that popcorn is a starch and contains calories. Natural popcorn with no additives actually contains about 375 calories per 100 gram. And this number goes up significantly once oil, salt, butter and other flavorings are added. So too much popcorn definitely won’t be good for your dog and will contribute to them putting on weight. Another thing to keep in mind is that the popcorn kernels don’t always pop. And if your dog eats, or tries to eat, these unpopped kernels they can damage your dog’s teeth and/or get stuck in their mouth. And once they’re stuck in the mouth, your dog can very easily pick up an infection. Also, although it’s unlikely, your dog could actually choke on the popcorn seeds. Finally, if your dog does manage to swallow the seeds, they’ll have a great deal of difficulty digesting them which can lead to an upset stomach. So avoid feeding the unpopped kernels to your dog if possible. And you definitely shouldn’t give your dog salted or buttered popcorn. Dogs really aren’t designed to handle large amounts of salt which can cause dehydration and kidney damage among other things. And the butter can lead to problems like diarhhea, obesity and diabetes. Having said that, on the plus side for popcorn is the fact that it’s high in fiber. This can help your dog’s digestive system. And as popcorn contains carbohydrates it can also help to give your dog more energy. So unflavored, unsalted popcorn won’t do your dog any harm in small amounts, and can actually have a couple of positive side effects. The answer to the question of can dogs eat popcorn is a qualified yes. Dogs can safely eat plain, unsalted and unbuttered popcorn, although it’s not necessarily recommended that you do give it to them as it’s not the healthiest thing for them. The healthiest diet for your dog is a simple quality dry dog food. Like all treats, if you do give your dog popcorn you should only do so in moderation – maybe a few pieces at a time. And try not to let them get any unpopped kernels as these can cause problems. As always when giving your dog something new, you should monitor them and look for any adverse reaction. And of course, be sure to take your dog to the vets for regular check-ups.